It is so hard to get good, vegan, Indian food in Berlin. Dave and I have never eaten so little Indian food in the last 20 years. As I have said before, I love dahl for both feast and famine situations. 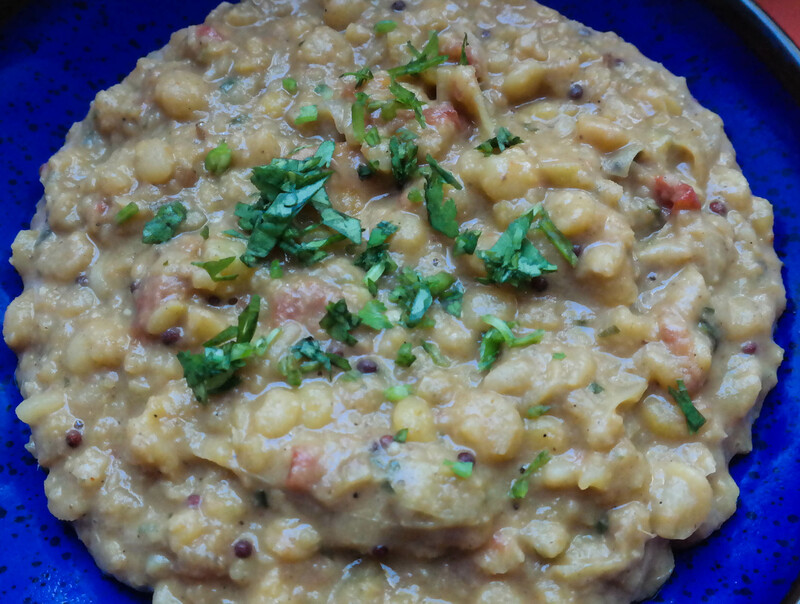 This dahl is a more luxurious dish than the chana dahl with spinach. It has lots of coconut milk to make it creamy. If you can get fresh curry leaves it would taste even more authentic but I cannot get them here. This is just as nice served with rice or bread. We also ate the peanut sambal with this that I had made to go with the samosas. Heat the oil and add the seeds and garam masala and toast for a minute before adding the onion. Cook for 5 minutes until the onion is soft then add the tomatoes and the ginger, garlic, chilli paste and a tablespoon of water. Cook over a low light for about 10-15 minutes, adding more water if necessary. The tomatoes should be soft. Place the whole contents of the pan into a blender and blend with a tablespoon of coconut milk. Return the blended paste to the pan and add the dahl which has been pre-cooked. Add the rest of the coconut milk and half of the corainder and stir well. Bring to the boil then simmer for about another 15 minutes until it is thick and creamy. If it starts sticking to the pan, add a little water. Season to taste and garnish with the remaining coriander.